The community energy stories of Evanston, Maywood, Springfield and Carbondale that follow are only a part of a much larger saga of community energy programs in Illinois. In these times of transition from low-cost to high-cost energy, the frontier is everywhere and every community is a pioneer. There are huge jobs and small tasks; there's a role for every sector. For example, the City of Chicago has two full-fledged bureaucracies to deal, in part, with energy: a new Department of Inspections and the Department of Planning. Peoria has an energy commission. The Village of Chatham distributes water savers for shower heads. In the private sector, there's Chicago Title and Trust touting energy-efficient buildings and Rockford Savings and Loan pioneering in the field of financing energy-efficient building construction. There are grass-roots organizations like the Illinois Public Action Council which organizes low-income people to fight utility hike requests; and the Illinois South Project which is an advocate for the resources and the people of the southern counties with their coal and farmland. And then there's the Pembroke Cooperative in one of the poorest villages in the state. Working with a large solar greenhouse and intensive gardening techniques, it plans to turn its newfound expertise into marketable solar products. Of the community action agencies, the Tri-County Opportunities Council (serving Lee, Ogle, Carroll, Whiteside, Bureau, Putnam and LaSalle counties) is recognized nationally for its home weatherization project. Of the regional planning agencies, the Northern Illinois Planning Commission is the catalyst for establishing energy-efficient building codes in suburban communities in that area of the state. Universities and community colleges have also been active in community energy projects as the following stories illustrate. Each of the four communities discussed below has made giant strides in planning for a high-cost energy future. All used federal or state funds to a major extent, and all now need to find new sources of capital. Partial support for the energy series has been provided through a grant from the Office of Consumer Affairs of the U. S. Department of Energy. Opinions and conclusions expressed in the article are solely the responsibility of the authors. Becky Bradway is a free-lance writer and graduate student in literature at Sangamon State University. Margaret Knoepfle is associate editor of Illinois Issues. IT IS not surprising that Evanston was one of the first city governments to start moving on ecology and energy issues, or that it has gotten a lot of cooperation from private citizens. Those matters are dear to the hearts of liberal, middle-class academic and professional people, and Evanston is, after all, the home of Northwestern University. But the city is more diverse than the stereotypical university town. With a population of 73,706, including a sizable black population, Evanston is split fairly evenly between upper-income and low-income residents among the latter are students and senior citizens, many of them living in multi-family dwellings. As a result, the community energy work going on in Evanston reflects a variety of approaches and concerns. Besides its own energy program, the city has two active private organizations: Epoch B, which pioneered solar workshops and retrofitted the Evanston Ecology Center, and the Urban Ark, a nonprofit corporation which specializes in energy conservation and retrofitting for low-income homes. Back in the 1950s, the Evanston Environmental Association converted a barren strip of land running through the center of the city into an arboretum. In 1974, the Evanston Ecology Center was built by the association with private funds. Located in the arboretum, the center featured interpretive exhibits and was also a meeting place for educational programs and discussions. the work they did was down to earth: insulating the Evanston Ecology Center, learning how to install solar systems, running workshops on a variety of alternative energy topics. Early on, Epoch B had the cooperation of the Evanston Environmental Association which allowed them to use the center for its experiments in alternative energy use and continues to work with them in promoting solar energy and conservation. taught basic building and solar principles such as heat loss prevention, insulation, solar heating and wind-powered generation of electricity. Each workshop was attended by about 35 people, with a total of 300 volunteers. Those who had knowledge of construction principles donated time and effort helping those who didn't. At the end of this initial phase, the group had insulated the center, constructed solar panels, and installed a small, wind-powered generator. After this early work at the Ecology Center was complete, Epoch B received a grant from McDonald's Corporation to publish a booklet, and in 1977 obtained $33,000 in revenue sharing funds from the city of Evanston. This money enabled them to do even more at the Ecology Center: They added a solar heating system, a solar hot water heater, additional insulation, a larger wind generator and a solar greenhouse. They were also able to hire a project coordinator. Photo courtesy Evanston Environmental Association Nearly 200 people attended Retrofit '82, a conference in February sponsored by the Evanston Environmental Association Epoch B, in cooperation with Evanston Township High School, the Illinois Department of Energy and Natural Resources and the Energy Committee of the Chicago Federal Executive Board. At the lectern is Tim Philip, Philip Solar Associates, and seated panel members are, from left, Robert Abele, the Energy Store; Wayne Shick (behind Abele) and John Porterfield, both of the University of Illinois; and Rodney Wright, solar architect. 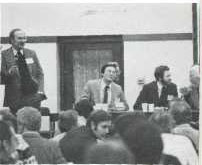 Retrofit '82 Conference conducted this February which attracted 200 people interested in learning how to make their homes more energy-efficient. Epoch B runs a speakers' bureau stocked with lecturers who will, for a fee, talk on a variety of energy topics. One of the early members of Epoch B was Evanston resident Leanne Sowande-Brent. Convinced of the, value of what she had learned in the workshops and determined to get the word out to Evanston's low-income residents, Sowande-Brent established the Urban Ark in 1979. With Community Development Block Grant funds, the Urban Ark embarked with the city of Evanston on a three-year program of retrofitting low-income housing. The Urban Ark also manages an energy services co-op which surveys members to find their needs and then buys products in low-cost batches. For the Urban Ark, as for many community energy organizations, 1982 is a year of transition. This year the block grant funding runs out, and the Ark is not reapplying. "There is a place for grants," Sowande-Brent explains, "but it is a bad idea to require them to keep going. We're now at a stage where we put up or shut up." The move into the private sector is still in the planning stage, and there are many possible choices. One option would be for the Urban Ark to establish its own foundation; another would be to become a corporation and enter into an agreement to perform services for other agencies or corporations. The Urban Ark would like to continue its rehab work either through contractors or through less expensive do-it-yourself workshops; it would also like to find funds for the undercapitalized co-op. Admitting all these difficulties, Brent feels that taking one's chances in the marketplace has some advantages: "Nothing comes easy," she says, "and we do have a marketable product — and people do need to work." While Epoch B and the Evanston Ecology Center were developing their programs, the city itself was also working on energy problems. After Evanston's comprehensive plan of 1975, city planners began to spend more time on energy issues. By 1978, a student intern was working 20-30 hours a week, and in 1980 the present full-time energy coordinator was hired. Evanston has been auditing city buildings for energy efficiency since 1979 and has steadily invested in capital improvements and energy retrofits to improve efficiency. In 1978 the city began conserving gasoline by buying smaller cars and converting to diesel models for its full-sized police fleet. This May, intermediate-sized cars will be converted to compressed natural gas. And the Evanston recycling center, started back in pre-OPEC days, though not yet breaking even, has recently been expanded and is close to being self-supporting. Along with recycled paper, glass and metal, the center sells firewood and wood chips. Meanwhile, Evanston energy coordinator Dave Birr is working with Epoch B on promoting Residential Conservation Service home energy audits, expanding workshops and making them available to other North Shore communities. Another joint project is an energy plan to be distributed to community leaders and perhaps ultimately included in the general policy plan for the city. According to Birr, the plan will be an "educational document" 20 to 30 pages long. Using nontechnical language, it will discuss issues in energy and develop "response options" to energy problems. When completed, the energy document will go to the Evanston City Planning Commission for approval and then to the city council. Like other cities, Evanston has a long way to go in the energy transition that is changing economies and lifestyles across the U.S. But Evanston has also come a long way, and at least some of that progress occurred because two housewives, a teacher, a professor and the director of the Evanston Ecology Center met together in 1976 and founded Epoch B. LOCATED in the western Chicago suburbs, Maywood sometimes calls itself "the village of eternal light" — not off the mark for a town that is using solar energy to heat its fire station, its police station and many of its homes. Maywood is a moderate-income community of 27,998 with an ethnically diverse population, including Hispanics, blacks and whites. To finance its energy-saving rehab and construction program, the village has made use of municipal general obligation bonds and Community Development Block Grants and is now working with local banks. Most of Maywood's activity has come from one source: the Maywood Community Development Office, headed by energetic Sandra Sharp. Although the office had been involved in energy conservation since 1975, the turning point as far as public awareness was concerned occurred in the spring of 1978 when Sharp enrolled in a solar energy class at Thornton Community College. Anxious to publicize the need for energy conservation and to "demystify" solar energy, Sharp developed a project to retrofit Maywood homes for solar heat and hot water. Using Community Development Block Grant (CDBG) funds, Maywood purchased two abandoned houses from the U.S. Office of Housing and Community Development. These were repaired, heavily insulated and retrofitted for both passive and active solar heating. Sharp worked in conjunction with the Hawkweed Group of Chicago which designed the solar retrofits and handled most of the technicalities. By the fall of 1979, both houses were complete and ready for sale at $50,000 each. Since then, one house has been sold and is now occupied; the other has been kept off the market for use by the village as a demonstration home. This was just the beginning of solar and conservation work in Maywood. Since then, the village has committed itself to achieving energy-efficiency in all new public buildings and to using active and passive solar heating whenever feasible. Above is a house in Maywood rehabilitated for solar energy; in the middle is the Maywood solar fire station; and at bottom is the model for the Maywood solar police station. sign as the completed buildings; it is to funded by a $1.5 million general obligation bond issue. Maywood plans to retrofit 15 to 20 houses in 1982; this will be paid for partially by CDBG funds and partially by the homeowners themselves. In addition, low- and moderate-income residents can get financing for energy conservation work on their homes through Maywood's low interest program, also backed by CDBG funds. The Maywood approach to retrofit incorporates passive solar design as much as possible, though many houses are not suited to solar because of their design or location. "But we do what we can to make them as efficient as possible," says Sharp. This includes the installation of solar hot water heaters, insulation and other weatherization, and "water savers" (small plastic devices that attach to faucets to cut down on water flow). The CDBG funding for both the loan program and the retrofits done by the city is scheduled to run through 1984. After that, cutbacks will be "imminent," Sharp believes. Maywood has no plans to make up for this probable loss of federal dollars by raising taxes. Instead, the Community Development Office is looking to local banks for capital and has come up with at least a partial solution. The First Suburban National Bank and the Maywood Proviso Bank have recently agreed to participate in a "rehab consortium" which will provide conventional loan financing for energy-efficient rehab work. Meanwhile, the Community Development Office continues to educate the public through workshops on energy conservation and solar power. The office is also distributing energy conservation publications printed by Northern Illinois Gas Company and encouraging people to tour the utility's "Northern Home," built to demonstrate energy conservation techniques. "Our work has been very successful," says Sharp. "Our goal is to heighten energy consciousness with the public, and we are doing more now than we ever did before." More efficient use of energy is a viable means of contributing to the economic welfare of Springfield. But a lot has to come through the marketplace. I don't think you can push this kind of thing from behind. It has to be the consumers who demand it. ON APRIL 6, 1915, the citizens of Springfield held an election to decide whether the city should go into the business of producing electricity. It was also the first election in which women were allowed to vote in Springfield; in the bitterly contested election, it was the women's vote which got Springfield a municipally owned utility. Springfield has long been unique in running its own electric utility and having the lowest rates in the state; it is also unique in putting together the largest citizen energy planning group in the U.S. — or so the Springfield Energy Project is described by David Morris of the Institute for Self-Reliance in Washington, D.C. Over 200 people worked on this two-year project sponsored by Sangamon State University. SSU classes completed an energy audit of the city, and 10 task forces composed of citizens from all sectors of the community came up with 300 pages of recommendations covering everything from attic insulation to emergency planning and local food production. The Springfield City Council received the report from the Springfield Energy Project in April. Addressing the council is Al Casella, project director and professor of environmental studies at Sangamon State University. The report was accepted by the Springfield City Council on April 27 with a resolution that the recommendations will be used "as a planning guide and tool with regard to future decisions regarding energy use." The goal of the Springfield Energy Project (SEP) is to cut the city's energy consumption by at least 40 percent by the year 2000. By doing this, SEP says the city could save millions of dollars over the next 18 years — dollars that would then be available for savings, purchases and investment within Springfield. SEP's audit of Springfield's energy consumption shows that in 1977, the city's energy bill was $101 million. That included fuel for transportation, plus all the heating, cooling, lighting and industrial needs of the city. By 1980, Springfield was spending approximately $157 million on energy. And by the year 2000, if current trends persist, Springfield could be spending $500 to $780 million in 1977 dollars or $2 to $3 billion in inflated dollars. Even worse, according to SEP, is the fact that 85 percent of the money Springfield currently spends on energy does not stay in the city; in 1980 over a million energy dollars left Springfield or, in this city of 99,637, more than $1,000 per person. Obviously, a local economy that is importing almost all of its energy and using it inefficiently is losing money. Low-interest loan program enacted by CWLP (Springfield's municipal utility) or Central Illinois Light Company (the utility supplying natural gas to the city) to provide upfront financing for weatherization. Energy-efficiency rating system for rental property. Energy information library located in the city's public library. Time-of-sale energy audit for houses. Incentives for construction of energy efficient housing by the Springfield Department of Community Development and Programs. Subdivision ordinances, zoning and access laws which encourage solar design. Energy audits in the commercial sector. A rating system for commercial rental property. Energy-efficient standards in the city's tax-increment financing plan for downtown redevelopment. Energy-efficient standards for future commercial construction. Financial incentives and training programs for local energy industries. Car pooling and van pooling. Incentives for pedestrians, bicyclists and fuel-efficient vehicles. Synchronized traffic signals and staggered work hours. Better patterns of land development and the use of telecommunications to reduce the need for travel. CWLP rate restructuring, including a conservation/lifeline rate that would reward conservation and help low-income residents cope with energy costs. Planning for future needs in waste management. A local growers' association to promote truck gardening. Pre-emergency planning to prepare the city for emergency supply cutoffs. Al Casella, SSU professor of environmental studies and director of SEP, began working with his classes on Springfield energy issues in 1979 after a visit from David Morris sparked interest in a citywide energy project. In 1980, SEP was formed with funding from the National Science Foundation, the U.S. Department of Energy and SSU. According to Casella, SEP is the only project of its kind initiated by a U.S. university; he hopes it will be an incentive for other schools to develop similar programs. Springfield energy planning now moves into a new phase: the politics and economics of implementing SEP's recommendations. Since all city departments were represented on the task forces (as well as businesses, schools, unions, hospitals, churches and neighborhood groups) many of the planners are potential implementers. This is an asset, plus the fact the SEP has given the energy conservation effort in Springfield "official status," as Jill Kunka puts it. But to be sure that there is progress, Casella and the convenors of the SEP task forces have established Energy Futures, Inc., a nonprofit economic development corporation whose job will be to help bring about action on the goals set by SEP. Membership in the corporation is open to all those interested in its goals; the corporation will be funded through membership fees and is also seeking private and governmental support. As to Springfield's energy future, what happens next is, to a large extent, up to Springfield's voters (and energy consumers) — just as it was in that crucial election 67 years ago. The security of this Nation, its cities and small towns is enormously dependent upon the creative melding of shared public and private capital, ideas and initiative. Whether Carbondale lives or dies on the energy issue is a function of what we in Carbondale have accomplished. . .and what we intend to accomplish. . .
AND THEN there's Carbondale. Located amidst the coal mines, apple orchards and hills of Little Egypt and strongly influenced by the presence of Southern Illinois University, this city of 26,286 is a national leader in the field of energy conservation. On January 1, 1982, Carbondale established its own "Municipal Solar Utility," one that the city claims is the first of its kind in the nation. A solar utility is not, as the name might imply, a fenced-off field of giant solar collectors; rather, it is a network involving all the various sectors of a community — government, business, finance, education and the general public. The general purpose of a solar utility is to keep local dollars within a community by conserving energy and by producing energy from renewable, nonpolluting sources. Testifying before the U.S. Senate Subcommittee on Energy, Nuclear Proliferation and Government Processes in May 1981, Carbondale's Mayor Hans Fischer described the goals of the utility: ". . .to steer a course free of the current shifting energy policy and unpredictable future energy plans of the Federal and State governments. . .to provide cost-effective, positive cash flow, energy conservation and renewable energy production systems and services. . . .to become a net energy exporter." Between the time Fischer made that speech and final passage by the Carbondale City Council of the proposal for the Municipal Solar Utility (MSU), there were compromises and cutbacks made in the crucial area of funding. Nevertheless, the utility is in place; it does have funding, and it opens up a new set of possibilities for dealing with Carbondale's economic and energy needs. The MSU is the realization of the efforts of a variety of people and organizations, including the Shawnee Solar Project (a local energy conservation and solar advocacy ' group), the city government, residents of Carbondale and faculty and students of the design department at SIU-C. With $5,000 in city money and a $52,000 grant from the Institute of Natural Resources (now the Department of Energy and Natural Resources), the city of Carbondale contracted with the Shawnee Solar Project to develop a plan for citywide energy conservation and production capacity. Written by Chris Robertson and Michael Besal of the Shawnee Solar Project, with assistance from Springfield attorney J. Randle Shick and financial consultant Larry Strange, the plan became the proposal for the Municipal Solar Utility. 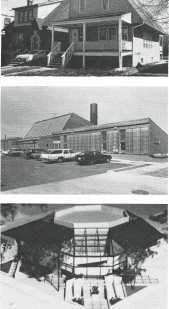 The original proposal for the MSU called for energy audits of all homes and businesses, low-cost loans to citizens to purchase weatherization and solar equipment, development of an energy production strategy, eventual construction of solar installations, and an energy education program. For the MSU, as for any other utility, raising capital is a major problem. The original proposal had a price tag of $2.65 million: This was to cover the first five years of operation, with 30 percent of the money going towards low-interest loans for energy-efficient rehab of "existing structures" in Carbondale. Part of this funding was to come from a proposed five-year Energy Consumption Tax. Based upon the amount of energy used by each utility customer, the tax would provide both revenue and a strong incentive to conserve energy. In addition, about 22 percent of the dollars needed for the MSU was to come from Central Illinois Public Service Company (CIPS), a gas and electric utility which serves Carbondale. (The city is also served by the Egyptian Electric Cooperative Association.) The money from CIPS, totalling $592,500 over the first five years of the plan, would help finance energy audits, education programs, production planning and quality assurance. According to Robertson and Besal, the economic activity resulting from this investment would generate about 850 person-years of employment in Carbondale, giving a considerable stimulus to the local job market and keeping more money within the community. Mayor Fischer supported the plan in its entirety. But when public debate over the proposed MSU began, a split occurred in the community with renters, homeowners, students and low-income residents on the pro-MSU side, and landlords, realtors and members of the Chamber of Commerce on the other. There was also a general reaction among Carbondale residents against increased government regulation and the proposed local energy tax, a view that some members of the city council shared. After much debate and compromise, the city council adopted a revised, shortened form of the MSU scheduled to become effective in January 1982. Absent from the plan, as finally adopted, were the Energy Consumption Tax and a promise of funding from CIPS. Community energy advisors working through the Jackson County Action to Save Energy (CASE) are pictured above. 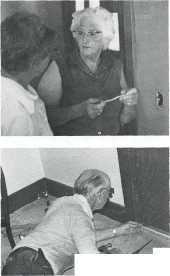 At top is Isabel Castellano teaching how to install switch plate draft sealer; below is Henry Luthy installing door sweep. Energy Audit and Quality Assurance Program: The energy division of the Community Development Department is in charge of marketing audits through the federal Residential Conservation Service (RCS). This 24-month project to audit the energy efficiency of Carbondale residences will cost $15 per audit, with the city funding the audits of low-income or disabled citizens. The energy division will help the state's RCS audit contractor, the Illinois Energy Audits Association (IEAA), to market its program. Although the audits association has set a goal of reaching 3 percent of Illinois residences, the energy division will attempt to reach 66 percent of Carbondale residences. In order to achieve this goal, the city hired two of its own audit technicians in January and plans to train, free of charge, community members willing to become energy auditors. The energy division intends to provide more complete auditing than RCS, including thermographic analysis, building envelope pressurizatjon testing and computer analysis. Community Energy Education Program: The Shawnee Solar Project, has up to this point, provided most of the educational efforts in the Carbondale area through workshops, demonstrations and an Appropriate Technology Center which provides material on a variety of energy-related topics. It is expected that Shawnee Solar will continue in this work, but the city's energy division will also be active. Spending $62,000 over a period of at least 28 months, the division will conduct conferences and workshops on such topics as automobile efficiency, bicycling, ride-sharing, solar energy and cogeneration. Conservation Loan Fund: While there are hopes that Carbondale's private sector will be willing to supply loans for housing rehabilitation and weatherization, the city government plans to use $250,000 per year from CDBG funds for a loan and grant fund. The city council has earmarked $150,000 of that money for a low-interest revolving loan fund for low-income residents. An additional $50,000 will be used for energy grants to low-income families where the head of the family is over 65 or disabled, and $50,000 per year will fund a housing rehabilitation program with stringent energy conservation measures. Energy Production Systems Development: The city energy division hopes to start planning small-scale, renewable energy systems. This program, which was part of the original MSU proposal, seeks to develop safe, cheap energy systems that are comparatively simple to make and have a high probability of return on the initial investment. Projects would include: wind energy conversion, cogeneration, hydropower and simple solar technologies — perhaps eventually advancing to more complex technologies, such as photovoltaics. According to Robert Pauls, head of Carbondale's energy division, the city council has agreed to "strongly consider funding as the projects present themselves." How did all this activity get started in Carbondale? As in many other towns, interest in energy issues began during the 1973 OPEC oil embargo; unlike other towns, Carbondale did something about it. Early steps taken during the embargo included conservation of electricity and gasoline. A year later, Carbondale was using CDBG funds to rehabilitate 400 residences belonging to low- and moderate-income families. In 1977, the city council asked a Citizens' Advisory Committee to include energy conservation in the goals for the city, laying the groundwork for a comprehensive energy plan; an Energy Advisory Commission was created to accomplish this goal. Another important event that occurred in 1977 was the formation of the Shawnee Solar Project. Composed mostly of students or former students of SIU-C, this group spent its first year working on practical solar projects and education. But in 1978, the city and Shawnee Solar got their first experience working together when the city contracted with the group to maintain an Appropriate Technology Resource Center. The center, described by Mayor Fischer as probably the best in the Midwest, was funded by a grant through the city from the Institute of Natural Resources and by direct aid from the National Center for Appropriate Technology and Jackson County. Since then, the center has sponsored hundreds of workshops and demonstration projects and maintains an excellent library. While Shawnee Solar was gaining experience and a base of operations, the city in 1979 hired its present full-time energy coordinator and created the city energy division as part of its Community Development Department. Early work included an energy impact study of Carbondale, completed with the assistance of the design department at SIU-C, and revision of Carbondale's building code. The revised code, which stresses energy conservation and allows for passive solar design, was approved by the city council and became effective in 1981. That same year two energy forums and a conference were held to gather citizens' suggestions on developing a comprehensive energy plan for the city. The plan was drawn up by a 19-member citizen task force and placed into the city's policy document. On another front, Shawnee Solar working closely in 1980 with Jackson County's Community Action Group, CASE (County Action to Save Energy), had conducted 129 self-help workshops on low cost/no cost weatherization, reaching about 1,900 people throughout Jackson County. In 1981, the program was expanded to train residents of four adjoining counties in setting up CASE-type programs.